(Photo: LWF)Members of the Lutheran World Federation Council vote during a meeting of the LWF governing body in Geneva from June 18-22. GENEVA - The Lutheran World Federation has announced that it will not invest in fossil fuels joining other church, civic and faith-related bodies acting on their commitments to climate justice. 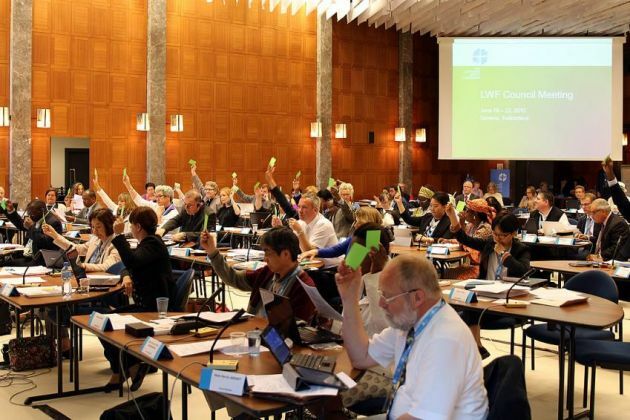 The decision was taken by the LWF Council, the governing body of the 72-million Lutheran communion, which met in Geneva from June 18-22. The LWF called on its churches "not to invest in fossil fuels and to support energy efficiency and renewable energy companies, and to encourage their institutions and individual members to do likewise." "Through this decision, we seek coherence and wish to send a strong moral signal that the world needs to operate a transformational change towards a low-carbon economy, phasing out fossil fuels and phasing in renewable energies by the middle of this century," said the LWF. A worldwide movement for fossil fuel divestment urges institutions to move their investments from oil, coal and gas companies. The burning of such fossil fuel products increases greenhouse gas emissions, seen as accelerating damaging and unpredictable climate change that can result in deadly natural disasters often badly affecting vulnerable and poor communities. The institutions backing the call to cull investments in fossil fuel include universities, religious institutions, pension funds, local authorities and charitable foundations. "We are encouraged that the Council has made the decision not to invest in fossil fuels and this puts action behind our commitment to becoming carbon neutral by 2050," LWF general secretary, Rev. Martin Junge said. "It is an important milestone and we trust as a faith-based community we are making our own contribution within our one human family to address the challenge of climate change affecting our one common household." The LWF Council noted that some of the churches in the Lutheran communion and the World Council of Churches, have preceded it in deciding to not invest in fossil fuels companies. "We are joining a broad global movement which is backed by the UNFCCC (the United Nations Framework Convention on Climate Change). "As a Lutheran Communion, we understand climate change as an issue of justice, peace, care for creation and protection for all peoples everywhere." We raise a special concern for the most vulnerable, in particular the poor, the indigenous people, and the voiceless."